GUANGZHOU, China, April 4, 2019 — (PRNewswire) — From March 28th to 29th, ZWorld 2019, an open platform for the sharing of engineering software was held by ZWSOFT in Guangzhou, China, which was a great success attracting over 400 attendees from 30 countries, including business and technical partners, customers, developers, experts and media friends. 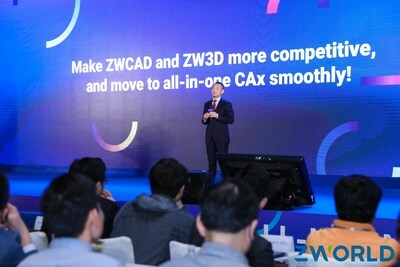 With the theme "move to all-in-one CAx" this year, ZWSOFT showed its latest progress in the CAx field and launched its first CAE product. There were also product values shared by its eco-partners and voices from its customers. ZWCAD, the reliable and .dwg compatible 2D CAD solution, is going to join all-in-one CAx with a more powerful platform. Its 2020 Beta version was rolled out with important enhancements, such as the IFC/STL/DAE format support, new PDF Underlay Manager, ATIL library and faster performance. ZW3D, the reliable all-in-one 3D CAD/CAM, is going to focus on faster and more responsive modeling, large assembly capabilities, and stronger application functions to serve more industries. The powerful features in its 2019 version, like User Define Feature, Shape Attribute and improved Assembly, received much attention. CADbro, the full-featured 3D CAD viewer showed its strengths such as 3D Viewing, 3D Annotation, Advanced Analysis and Cloud Service. CAD Pockets V4 has realized the integration of CAD Pockets, the mobile CAD viewer/editor, and CAD Chat, the web solution for teamwork. It satisfies the needs of both individual use and team collaboration, mobile and web devices. ZWSim-EM, ZWSOFT's first simulation product for electromagnetism debuted. It will benefit many fields like mobile phones, microwave components & circuits and metamaterial with a shallow learning curve, high speed and accuracy. With a history of 10 years (former called GPC), ZWorld is an important platform to share various product values based on the ZWSOFT ecosystem. In the future of moving to all-in-one CAx, we would like to provide more product values to our customers, and win together with our partners. ZWSOFT CO., LTD. (Guangzhou) is a reliable and innovative provider with its flagship products ZWCAD and ZW3D. It is devoted to providing a complete and seamless user experience with its all-in-one CAx solutions. With over 20 years experience in the industry, its products and services have been proven by over 900,000 clients across 90 countries.